IF YOU find yourself time poor when in Toronto, but still want to see the Niagara Falls, there is now the option of a one day trip. The train service makes experiencing Canada's most iconic natural phenomenon even easier. As you gaze up at the mighty falls, feel the mist on your face, and sense the power behind the mighty roar of the cascading water, time seems to stand still. Once you get to Niagara Falls there are some great ideas for feeling the mist on your face. If you are up to it, experience the adrenalin rush as you race towards Niagara Falls on the new MistRider Zipline to the Falls. Four parallel ziplines travel 670 metres through the river gorge, offering panoramic views of the American and Canadian Horseshoe Falls. This is one gravity-powered flight you won't forget in a hurry. The sound is like thunder. The sight awe-inspiring. Go deep below and behind the heart of Niagara and stand in the mist where the Horseshoe Falls tumbles from 13 storeys above. At Journey Behind the Falls, you'll experience the awesome spectacle of one-fifth of the world's fresh water crashing down to the basin below. Take a boat cruise to 'soak' up a view of this natural phenomenon. Don your mist poncho, climb up to the observation deck of a Hornblower Catamaran, and tour the Great Gorge, American Falls, Bridal Veil Falls and Horseshoe Falls, all from down below. After sunset, witness the falls light up in colour on a special "Illumination Night Cruise. Soak up the mighty mist of Niagara Falls by helicopter. 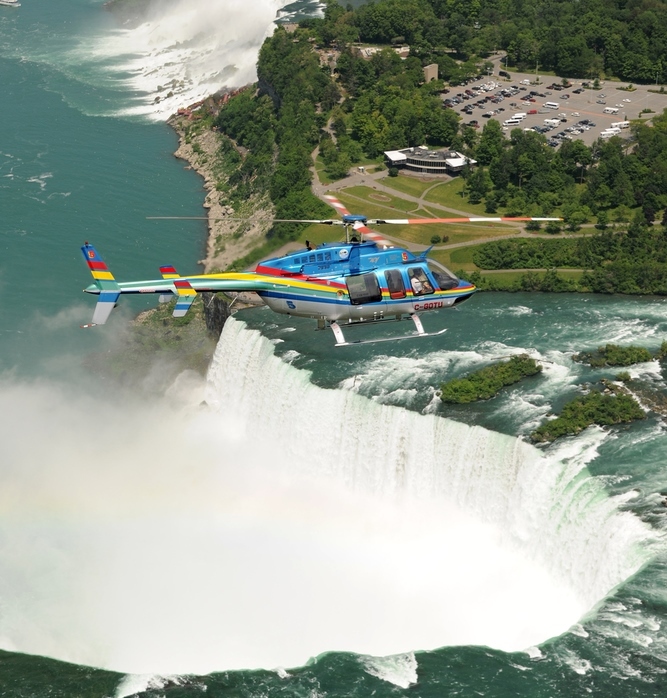 Discover Niagara and the historical surroundings from an eagle's-eye perspective on a heli-tour with Niagara Helicopter. Experiencing Niagara Falls from the cockpit of a helicopter is nothing short of breathtaking. Fly as close as possible to the thundering water on your personal tour - you'll want to bring your camera to this one! Indoor and outdoor observation spaces at the remarkable Skylon Tower allow you to take in the scenery from 235 metres above the action. Stay for lunch and marvel at the natural wonders of Niagara Falls and beyond, with views stretching for almost 130 kilometres. For more Niagara Falls visitor ideas,go to au-keepexploring.canada.travel.